Reelsawing allows the quick and clean shrink of paper reels and other web-shaped materials. Ideal also for damaged sides by water or mechanical impacts (stones, edge deformations). In 1993, the first roll saw was put into operation at APV. 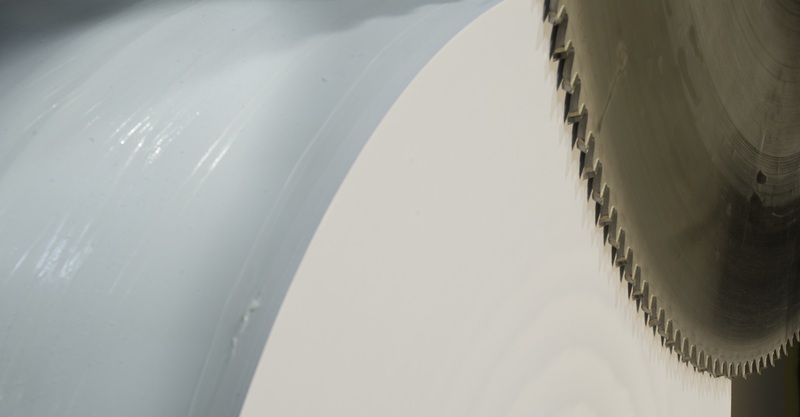 Since then, our sawing tools have benefited from numerous innovations and further developments. We are very proud to offer our customers the highest quality level. NBND Technology® – exclusive procedure by APV, grants a perfect finishing of the treated reel sides without glueing and dusting. Original reel properties remain untoched. Very short production times! Under certain circumstances, the delivering truck can wait for the rollers to finish. APV Germany saws all sorts of reel based papers and composites, such as India and PE coated paper.